As you've seen on DT, I continue to focus on juicy alumni journeys in entertainment. To recap, we've covered journeys in acting (from a guy's and girl's perspctive), music, TV and Film production and TV writing. And we even have advice on how to use DT in your entertainment career search. Today, I've got an interesting tale about a 2010 grad who got a good taste of working in one of my favorite daily television shows and is now changing careers and changing coasts for a career in law. All with the plan of hopefully returning to entertainment one day. This is "entertainment"/"law" path is a common one that I've seen over the years , but wanted to highlight it as there will continue to be Penn graduates who will contemplate this decision. and where he sees himself in 10 years! Starting from his time as an undergrad at Penn, how did Corey's path lead him to land his first job at "The Dr. Oz Show"? "I interned in the media relations department of Sony Pictures Television in LA during the summer after my junior year where I worked on the launch of their new fall shows including "Community", "Shark Tank", and "The Dr. Oz Show". 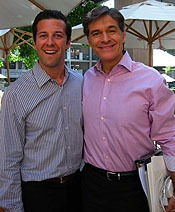 I became increasingly involved with the PR launch for Dr. Oz as the summer progressed. I assisted in planning our luncheon at the Television Critics Association, which is where I first met Dr. Oz. I kept in touch with my colleagues at Sony over my senior year and was offered to work on the production side as an assistant to our Director of Affiliate Marketing in New York for the 2nd season. Best part of the job offer: it was on the Friday of Spring Fling!!" What are some fun facts about working on "The Dr. Oz Show"? "1) This is not the first time in my life that I have encountered Dr. Oz. It’s actually kind fate that I ended up working for him. He operated on my grandfather in 1997 at NY Presbyterian—Columbia, where he still practices. It's crazy to have worked with him on a consistent basis 15 years later. 2) We tape in the famed 30 Rockefeller Plaza on the 6th floor in the former Conan O’Brien studio. We tape across the hall from Jimmy Fallon, which is always a treat because I’ve gotten to see my fair share of celebs. Personal favorite includes Sir Paul McCartney petting puppies backstage and Liza Minelli asking me where the bathroom is so she can go smoke. Right out of 30 Rock, we have our own personal Kenneth the Desk page (whom is currently a Penn ’09 grad: Monica Chen!)." 3) The man practices what he preaches. Yes, he actually eats Greek yogurt and blueberries everyday. Yes, you can see him snacking on walnuts during breaks from taping. Yes, he is extremely talented in everything he does. He is always on the go, and a wonderful talent to work with. I am very proud to say that he is just as amazing on television as he is in person." What did he do at Dr. Oz? "I worked as the assistant to our Director of Affiliate Marketing. Unlike a network show like "Glee" or "American Idol", Dr. Oz is a syndicated show—meaning that we air on different television stations across the country. We air on Fox in New York, but on ABC in Los Angeles (we move to KABC at 3 pm on Sept. 12) and NBC in Detroit. I worked with all the affiliate television stations (210 of them!) that carry Dr. Oz to find ways to promote the show. This includes integrating Dr. Oz into their news via health stories that we provide them, live satellite interviews, shooting custom promos, running contests to win tickets to the show, and travelling to markets with Dr. Oz to promote the show. Yes, I book Dr. Oz’s travel. So I probably know more than you ever would want to know about getting access to travel with brains and other bodily organs on airplanes. And if you’ve ever heard a radio copy promoting the show, chances are you’ve heard something I wrote!" What’s the production of a daytime show really like? "It takes a village to put this show together. We don’t just have a 22-episode season order like most primetime shows…we have 175 shows to do each year so it’s a pretty grueling process! We tape 6 shows a week and about 18 shows per month. Producers pitch ideas for segments a month in advance and our EPs decide what makes the “board.” The week before a show tapes, we have a grid meeting to discuss what the week’s shows entail. And trust me—we’ve had crazy things on the show before from camels live on stage to the Rockettes dancing on our Christmas show. Our associate producers book our guest and experts who appear on the show, and our audience makes sure we’ve got energetic people to fill those seats each and every day. On taping days, we tape a show in the morning and one in the afternoon. Dr. Oz rehearses each show once (yes, he’s that good!) right before he tapes it. Once a show tapes, it’s off to our post-production team to edit and finalize the show for delivery." What advice does Corey have for people looking to get into the entertainment business? "You’ve got to be passionate about the industry. Plain and simple. Television and film executives know whether or not you’ve done your homework. Read up on Nikki Finke everyday or get an e-mail subscription to THR [and subscribe to DT's Facebook fan page!]. The entertainment industry is not just about who you know, but what you know." Where does Corey see himself in 10 years? "A decade from now, I hope to have not only established a name for myself as a respectable entertainment lawyer, but also have several producing credits to my name. 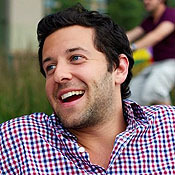 I have a strong interest in ultimately producing films, television shows, and Broadway theater, my personal favorite. I would also love to be able to live bi-coastally between Los Angeles and New York, where I grew up. Fortunately, I've always been someone who knew exactly what he wanted to do. But what excites me most is not necessarily getting there, but the crazy path that leads me to achieving my goals." Speaking of Dr. Oz, remember when this other Penn alum was featured in a Dr. Oz segment?